Most people are aware that winter storms are dangerous. What they don’t realize is it’s not frostbite and hypothermia you have to worry about most; automobile accidents are the leading cause of death from winter storms. When cold temperatures arrive and snow or ice threaten to cover the roads, it is best not to risk travel unless absolutely necessary. Still, accidents are inevitable, and often, they are the result of another driver’s negligence. 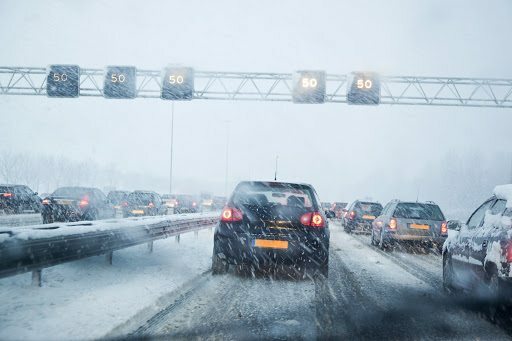 If you are involved in a car accident during a winter storm, you should react a little differently than you would on a normal day. Here are some smart next steps to consider. Turn on emergency lights and leave your headlights on. Snow can reduce visibility, and if your car is disabled on the roadside, you want to give other drivers (and first responders) the best chance of seeing you. Check for injuries and call for help. Make sure everyone inside your vehicle is okay. If obvious injuries are present, tell the 911 dispatcher when you put in your call for help. Consider staying in your car. In most accidents that involve two or more cars, drivers will get out and make sure everyone is okay. However, in wintry conditions or where there is low visibility, staying in your car until first responders arrive is highly recommended and could prevent further accidents. Discuss the details. Once the police arrive on-scene they can help facilitate the process of exchanging names, phone numbers, and insurance information. Most drivers want to know what to do after an accident, but it is also important to know what not to do. Do not leave the scene. This can result in unfortunate legal consequences for you. Do not discuss the cause of the accident with the other driver. It may seem obvious that snow or ice caused the crash, but you’ll want to have those conversations with police. Do not assume liability, or, admit that the accident was your fault. Again, you’ll want to first discuss with police. Many accidents are a headache long after the crash. Dealing with insurance companies can be challenging, especially when you’re not aware of your rights under NC state law. If you need further assistance or have questions about injuries, our legal team is always available to consult with you. Call us toll free at (877) 256-1214.